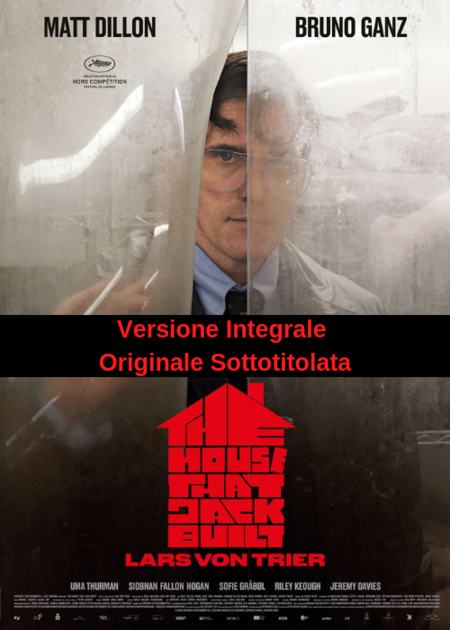 LA CASA DI JACK (THE HOUSE THAT JACK BUILT) - V.O.S. Trama: Boundary-pushing cinematic visionary Lars von Trier (Antichrist) returns with one of his most daring, masterfully provocative works yet. In five audacious episodes, failed architect and arch-sociopath Jack (Matt Dillon) recounts the elaborately orchestrated murders-each, as he views them, a towering work of art-that define his "career" as a serial killer. Mixing pitch black humor, transcendent surrealism, and renegade musings on everything from history to architecture to cinema, von Trier fashions a radical, blazingly personal inquiry into violence, art, and the twin acts of creation and destruction. With Uma Thurman, Riley Keough, and Bruno Ganz.